Young English immigrant Gabriel Fox comes to the marvellous Melbourne of the 1870s as a third class passenger, falling in love with a first class girl against the social conventions of the time. But the extraordinary characters he meets in this fast growing city don't care about convention, and that is a great help in winning the girl's hand. He is plunged into the often dishonest financial dealings of the time, with all the attendant political and social stresses. While remaining honest himself, with great difficulty, he faces bank crashes and deals with a partner who registers a building society with a paid up capital of one pound. Gabriel has a wild ride in Melbourne to ultimately reach his own fortune. Gabriel Fox was in a rattling, speeding train, when he had a vision from his recent past. Once again he was in a queue walking up the third class gangway to board a ship at London Dock. He glanced across at the first class passengers who were walking up to a different entrance. Opposite him at that moment was the most beautiful girl in the world. He stared at her and she must have sensed his presence because she looked across and smiled. He waved to her and she waved back, still smiling. A woman with the girl, probably her mother, took her arm and urged her on. She looked at Gabriel and seemed not to like what she saw, and then he was pushed in the back by someone’s portmanteau to remind him he was holding up the queue. His vision ended in steam and smoke and the rattle of a train entering a station. It stopped and someone was shouting ‘Flinders Street, all change.’ Porters walked up and down the platform slamming shut swinging doors left open by departing passengers.He got his luggage down from the overhead rack and joined the exodus. He was surprised when he came out into Flinders Street and saw the road traffic passing by. Rumbling, clashing four wheel lorries and drays, all with steel rimmed wooden wheels, all drawn by big patient horses with jingling harness and rolling along in two unending streams, travelling east and west. He had thought that Melbourne would be a quiet colonial town with tree lined streets. Planters, perhaps. with wide brimmed hats, wives presiding over 'At Home’ gatherings of other genteel, tea drinking ladies from neighbouring plantations. It was not like that all. 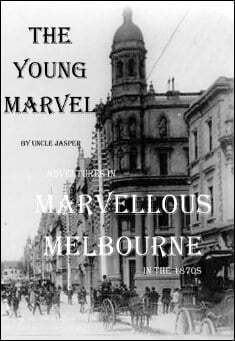 Melbourne, was a busy, commercial city, scarcely more than twice his age, and growing fast. A few loungers and drunks sunned themselves on benches or sat with their feet in the gutter and leaned against the wooden posts that supported the veranda over the station entrance, but everyone else in the crowds hurrying past walked with purpose, intent on business. He looked out on all this activity and, with the passion of youth, thought again of the girl. She was in this town somewhere and he would find her if it took the rest of his life. It was November 1879 and he was twenty two years old. passengers from the train were now intent on crossing the road and the way was cleared for them by policemen who who brought the traffic to a halt . From the other side of the road he looked and saw a road bridge over a river and beyond it a tall three masted ship being towed away by a tug belching black smoke. It was a swinging basin where ships could be turned around and berthed. There were wharves and warehouses on both sides of the river. He looked away. First he had to find accommodation. He stopped to look at one single storey hotel that might have cheap lodgings, and was greeted by the stares of some loungers who were either leaning against the veranda posts or sitting on a bench looking out over the river. One of those holding up the veranda , after some thought, spat neatly on to the ground alongside him. "Just in mate?" he said. "What?" said Fox, not sure of the customs of the country, and thinking this might be some sort of greeting. "Just orf the boat, arnt cha," retorted the lounger. "Gotcher nice little bloody bags, and yer nice bloody suit yer got from some lah di dah shop in London. I s’pose the tailor’s still sending bills ter yer old dad’s castle; fat chance ‘e’s got of gettin’ the money now. " Fox was confused and fascinated at this speech. He understood most of what was said to him but the strange accent and the copious use of swear words was beyond his experience. If he had been in England he would have edged past the man and ignored him. Here he hesitated because the man might be friendly after all, and this greeting one of the local customs. "If it wasn't for you bloody lot comin' over all the time we'd have a decent country here. Yer sent me old man out as a convict and now we’re makin’ somethin’ of the place you collar and tie lot come out to show us how it’s done. Give us a deener!" The last sentence was incomprehensible to the young Englishman, he had been asked for something, but what? "Gor blimey," said the lounger, disgustedly. "They come over and reckon they're going to own the bloody place in six months and they can't even speak the language. Yer just in from the Old Dart arnt cha? Well give us a deener, a bob--Gaw blimey, a shillin'. You know that much English, don't you?" Under the glare of the Australian, and his friends who were taking an interest in the conversation, Gabriel Fox groped hesitantly in his waist-coat pocket with thumb and finger and produced a florin. "I haven't got a shilling," he said; uncertain whether to hand over the money or call for the police. "That'll do," said the stranger ungraciously, "hand it over, and be bloody quick about it." He seized the two shilling piece and put it in his own pocket. "Come on you blokes," he said to his companions, grinning broadly, "line up, the drinks are on the new chum this time." They all promptly vacated their veranda posts and marched through the bar doors leaving Fox outside, angrily listening to them in the bar, laughing. For a moment he thought of going in and punching his tormentor on the nose, but all his instincts were against getting mixed up in a public brawl, which he would probably lose anyway. He glanced down at his clothes, they were clean; even if he did win the fight and taught the upstart colonial a lesson they could become dirty and torn. They were one of his few assets and must be kept in good condition. Better to regard the two shillings as well spent on a lesson showing the temperament and feelings of some of his new countrymen. He was about to turn away from the scene of his humiliation and look for somewhere else to stay when he had another thought. He hesitated, then picked up his bags and followed the men into the bar. They were lined up ready to be served. As soon as he stood with them and put his foot on the brass rail the chatter and noise died away and they waited to see what would happen. "Where's mine?" he enquired mildly; "you didn't forget to order for me, did you?" "You looking for trouble," enquired the man who had the two shillings. He was some years older than Fox, approaching thirty. The sleeves of his shirt had been cut off at the shoulders showing his arms which were exceptionally well muscled and covered in tattoos that displayed patriotic and filial sentiments. "If you want to kick up a fuss, mate" he continued menacingly, "you've come to the right bloody place to do it. "I'm paying for the drinks," said Fox, aggrieved. "That is my two shillings you have in your pocket, you weren't going to leave me out were you?" The Australian continued to glare at him and then relaxed. He grinned and nodded. "O'Hanlon," he roared at the barman, with a voice that made the bottles on the shelf clink together; "Make it five. I thought at first," he said turning back, "you'd come in to make a stoush of it. Just as well you didn't. I would've wiped the floor with yer, and then the johns would've been onter me, and I probably would have had to do a couple of moons hard out at the stockade. I gotta be careful not to do me block nowadays because the last time I was up the beak said he'd do me brown next time." Fox could only nod agreement at this speech and drink the beer which was presently handed to him, because he understood scarcely a word.